If you’re a peripheral person you’ll be pleased to hear about the latest creation in Movea’s mouse range, the Air Mouse GO Plus. This expands of the features of their previous offering buy giving consumers the option of three assignable buttons to customize their experience. 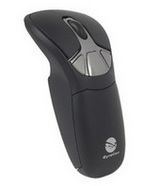 The mouse lets you work wireless with your computer within a 30 meter radius of clear vision, and the buttons lets you programme features into your device. You can set up specialized buttons for opining applications and playing media, as well as utilizing the gyroscopic features by flicking your wrist to change the volume. It’s uber simple to use, as you simply plug in the radio frequency USB receiver, press the connect button, and voila, you’re hooked up. It works with Vista and XP systems (but with no mention of Windows 7 or Macs) and comes with a desktop charging cradle and a RF receiver.